Citation Information: J Clin Invest. 2007;117(4):1029-1036. https://doi.org/10.1172/JCI29472. CD28-independent proliferation and cytokine production by Cblb–/– CD8+ T cells. (A) IL-2 and IFN-γ production. 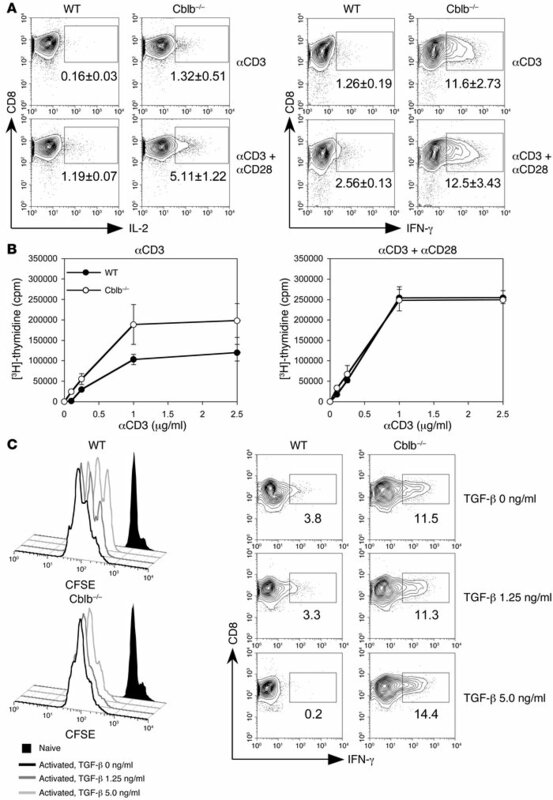 Purified CD8+ T cells from WT and Cblb–/– mice were stimulated with either plate-bound anti-CD3 or plate-bound anti-CD3 plus soluble anti-CD28 antibodies. IL-2– and IFN-γ–producing cells were visualized by intracellular staining and analyzed by flow cytometry. Shown are contour plots of intracellular staining for IL-2 and IFN-γ expression in CD8+ T cells. Percentages of IL-2– and IFN-γ–producing cells are indicated in the plots as mean ± SD from 3 independent experiments. The boxed regions indicate the gates used for calculation of the percentage of CD8+ T cells staining positive for IFN-γ. (B) TCR-induced proliferative response. Purified CD8+ T cells from WT and Cblb–/– mouse lymph nodes and spleens were stimulated with various concentrations of anti-CD3 antibodies in the presence or absence of anti-CD28 antibodies. Cell proliferation was determined by [3H]-thymidine incorporation and presented as mean ± SD for triplicate samples. Shown are representatives of 3 independent experiments. (C) Resistance of Cblb–/– CD8+ T cells to TGF-β suppression. Histograms (left) show CSFE intensities of labeled Cblb–/– and WT CD8+ T cells after 3 days of anti-CD3 and anti-CD28 stimulation. Cells were cultured in the absence or presence of different concentrations of TGF-β as indicated in the figure. Contour plots (bottom) show the IFN-γ production in the absence or presence of TGF-β. Percentages of IFN-γ+ cells are indicated in the plots.